If you have yet to try your hand at preserving your harvest, this is a great way to get your feet wet. 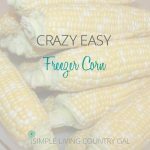 Super easy, just a few steps and only several ingredients freezer corn is a must have for any garden lover. The hardest part of this recipe is the shucking and you can always get your family to do that for you! One batch makes about 4, 1 quart bags of freezer corn. Each batch takes about 10-15 ears depending on the size of your corn. The supplies you will need is a sharp or electric knife, a large bowl, a small bowl and a roaster. 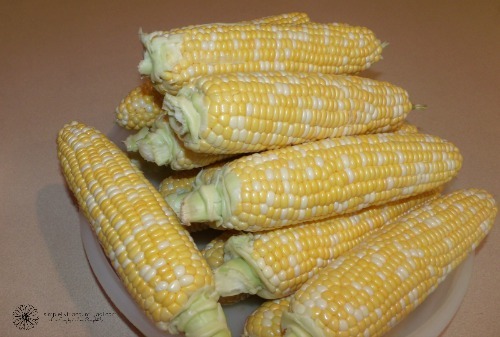 Start out by husking your corn, approximately 10-15 ears will make a batch give or take depending on the size. You will need approximately 16 cups of corn kernels. Now, it’s time for kernel removal. The easiest way to do this is to put a small bowl upside down into a larger bowl. I like to use an electric knife, but you can use a regular knife as well. 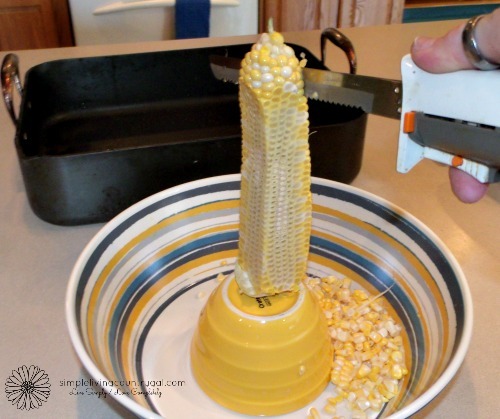 Simply hold your ear of corn on the bowl and cut the kernels off. Easy Peasy! Try to get as much of the kernel as you can. Whole kernels are much better when small cut ones. The large bowl “catches” the kernels without make a horrible mess. this is also a good time to clean your kernels a bit more. Any hairs or husk pieces you miss are easier to see in the bowl. 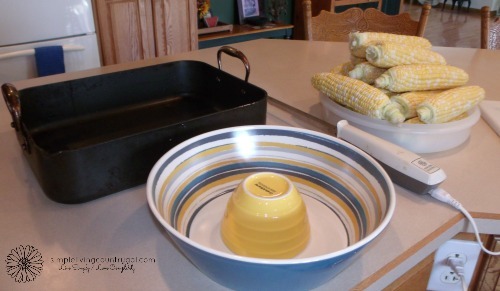 Once you have about 16 cups you are ready to par cook your corn. 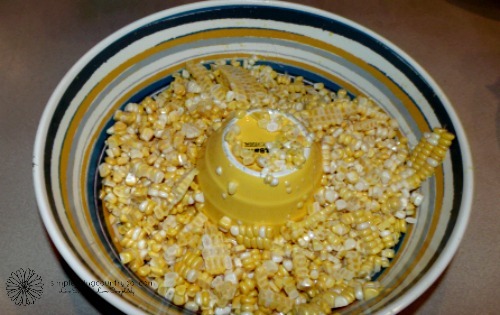 Measure out your corn and pour it into a roaster. You really do not need to be exact, so if you have a bit more or less you will be fine. I like to use a roaster since it is easier when working with so much corn. Add your hot water, butter or margarine, sugar, and salt. 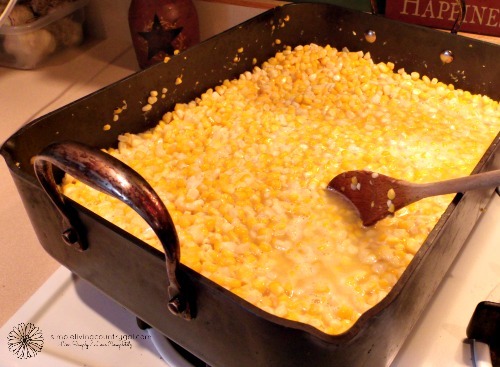 Bring your corn to a soft boil on your stove and simmer for 10 minutes. Halfway through your simmer, do a taste test and adjust your sugar and your salt accordingly. Remove your corn and let it cool enough to put into freezer bags. I leave my bags open until the corn is cooled completely. Once cooled seal your bags, label with the date and put into your freezer. Corn can be kept in your freezer for up to a year. Now you can feast on your labors all winter long! Enjoy! You can find this post on one of my favorite blog hops! Nothing is better than sweet freezer corn! This corn is crisp, sweet, and simply delicious. One of the first things I learned to preserve and I have filled my freezer with this recipe ever since. 1/8 cup Salt I use a little less than this. Husk corn, be sure to remove all hairs. Use a knife to remove kernels until you have 16 cups. Put corn, water, butter, sugar and salt in a roaster and bring to a gentle boil on your stovetop. Simmer for 10 minutes. Let cool and spoon into quart sized freezer bags. Once completely cool, label and put in your freezer for up to one year. I can’t believe what you are doing to your SWEET corn. Hence the name, why are you adding sugar? 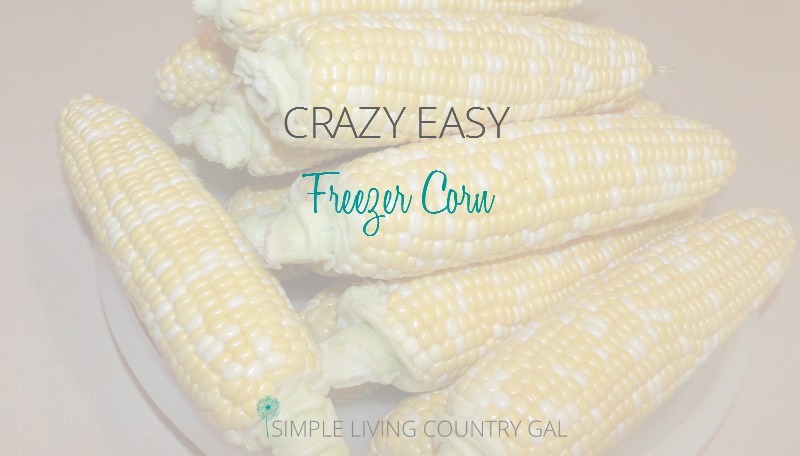 Do you want to know how to freeze sweet corn? Here it is. 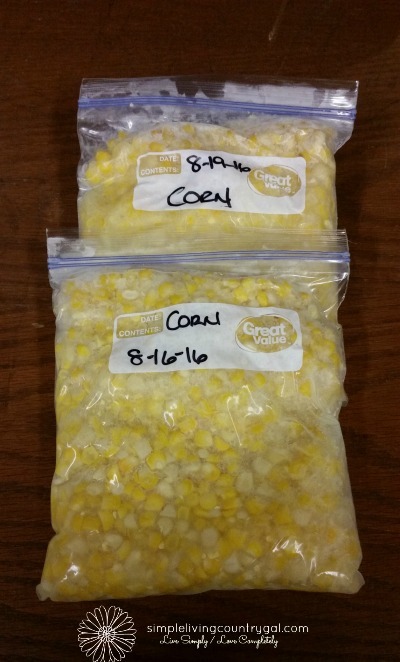 Remove corn from cob, put into freezer bags, put bags in the freezer, DONE. Add your little bit of butter/salt when you take from freezer to heat and eat. Yes, haha, this family has a rather severe sweet tooth! I have done it the other way, but my family prefers it this way. You are absolutely correct, you CAN simply remove the corn and freeze as is.